From I-94, take exit 159 onto US-83 North. In about 115 miles will be the gate. Once through the gate, stay on Missile Ave to the end and register at Outdoor Recreation. Turn left to the campground. ---- From junction of US2 & US83 go north on US83 to enter thru the 'MAGIC CITY' gate. You will be on Missile Ave, follow to Outdoor Recreation to register then follow Missile Ave to end then turn left to campground. May 15 - Oct 15. We are currently camped here on a weekly rate. The sites are in the open and can get quite breezy. There is a comfort station located across the playground. It appears to be routinely maintained but used by all who use the playground, jogging track, & campsites. Lighting inside is a bit dim. There are an abundance of prairie dogs & the grassed area is riddled with their burrows so care is recommended walking to & from. We found 2 issues with the online description. 1. This facility does NOT honor Golden Age/ Access Discounts. 2. 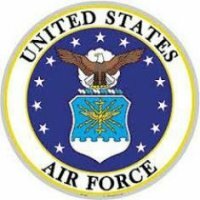 The web site address is https://5thforcesupport.com/activities/outdoor/ it is very sparse but that is the correct address. We are finding our stay enjoyable and would stay here again. We camped here in a 5th wheel. 7 spots, very tight. Clean, nice people. Close to exchange. No sewer connection and the dump station in front of spot 7. T.L. left this review using the Directory software: - Enjoyed my stay. You can use laundry at Temporary Living Quarters near Outdoor recreation. My only negative is that there are virtually no businesses within about 10 miles of the base. I've tried to find one of these 6 spots empty on 4 separate occasions in the past 6 weeks with no luck. To a casual observer it looks like the same 6 rigs are there permanently. The large friendly looking overflow lot is permanently blocked off, so no luck there. Its a 10 mile or so trip each way to get here if you're traveling on highway 2, with bad roads in Minot itself, so it seems like a long drive just to be disappointed. It sure would be nice if someone saw fit to add some spaces! We enjoyed our stay at this Famcamp. However, we had to spend the first night at a local campground, Rough Rider campground. 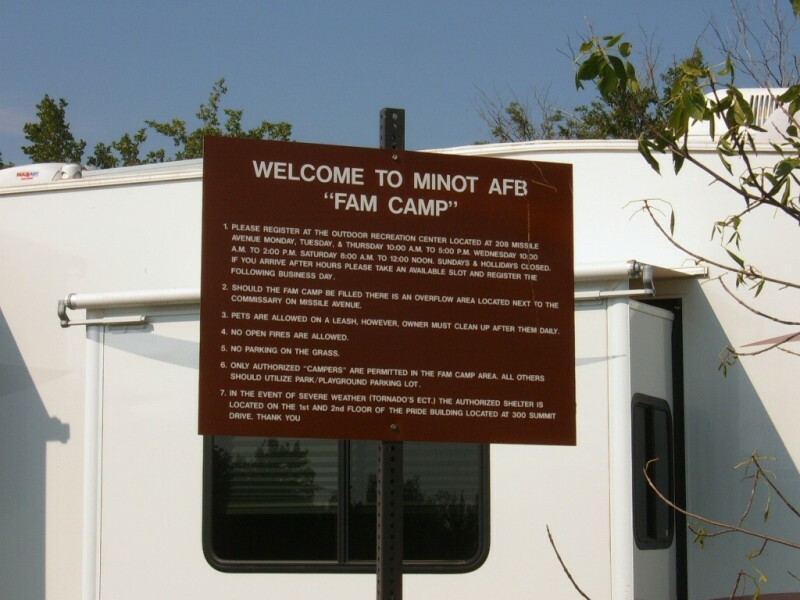 Minot no longer permits overflow camping in the commissary parking lot. We were lucky to get in as there are only 6 sites. They say they are trying to get authorization for more sites, but I suspect that has been happening for a long time. Because of the floods last year, many of the local campgrounds have closed and may not reopen. Some of the Famcamp sites were taken up by contractors and active duty personnel staying a long time, according to the dates listed on their post tags and the length of the grass around their campsite. If you go there, have an alternate plan because there just are not many options if you can't get in. We don't mind boon docking and we can do it here for free. Plus - the base sends a pumper truck around to the overflow/boondocking area. It will fill your water tank and pump out your black tank daily for free. And the overflow area is only a couple hundred yards from the BX and commissary. We would rather boondock than pack for a campsite in the RV park. It is great here with lots of grass and open are. When you compare it to something like Walmart or another parking area over night for the same price--($0) this is much better. We camped in a motorhome and would do this again when we are in the area. First off the price of 60 dollars a week is hard to beat so I tolerated the fact that my faucet didn't work and two days later I got a splitter to connect into and had to run over 80ft of hose or that of the only 6 spots 3 where homesteaders that were waiting for housing or that my homesteader next to me had 3 dogs of which two where over 100 pounds and not ONE time did I see them clean up after them there was no smell but a sight to be hold because I didn't need to go to the mountains I plenty in view. the dogs were hooked on about 6ft of line as the rules states but don't quite think that's what they meant (the leash rule was for walking them and never ever noticed that) or the fact that the one is trained to whine when it wants back in even if the family of 3 are gone from there 30ft trailer with there 3 dogs that really feel that they can park on the grass with there two trucks or play music late and no I never said anything because 60 dollars is a real good deal, but on the high side other then the really good deal is that the Base is great and I drank alot to enjoy my really good deal but will pass if that is how it will be if I stop by again. Everything about this FamCamp has already been reviewed. We would certainly stop here again. S.M. left this review using the Directory software: Nice out of the way spot, small but adequate for just staying a few days. S.M. left this review using the Directory software: We ended up staying three nights, only because I had a little mishap at the car wash. It was a very pleasant stay and we will stay here again. I just wish the Golden Age/Access cards were honored at all the famcamps around the country so that it would help out the older vets who are on limited incomes. The sites are a bit small, so don't know if a 40 footer would fit here or not, we're 35ft and we barely fit okay. The base is located 13 miles North of town. Not to far off US2. Not for the Interstate traveler tho. The base is a busy installation with much going on. The Commissary and BX are first rate. And within walking distance of the "FamCamp". The "FamCamp" consists of six(6) concrete slabs on a tree line next to a community park. West facing with a full dose of afternoon sun. There are not options for after hours check in. Not envelopes, no drop box. Just a few rules on a sign. No contact numbers. Water was still not available. Same as last years comments. There are no other facilities available at the "FamCamp". No laundry, no showers, no restrooms unless you count the porta potties at the other end of the park parking lot. The Base Laundromat is an unmitigated disaster. Three machines. Rusty, dinged, one full of water stinking of mold. Nice little campground. Water and 50 amp only, but that's not so bad. They have 6 sites, but water only works at four of them. You can hook your hose to one of the other sites. Not a very busy campground, but well maintained. It is only $60.00 a week, so if you have a tote, this might be the place for you. The have a laundry on base, but it is a drive. Nice place to say if you are passing through. 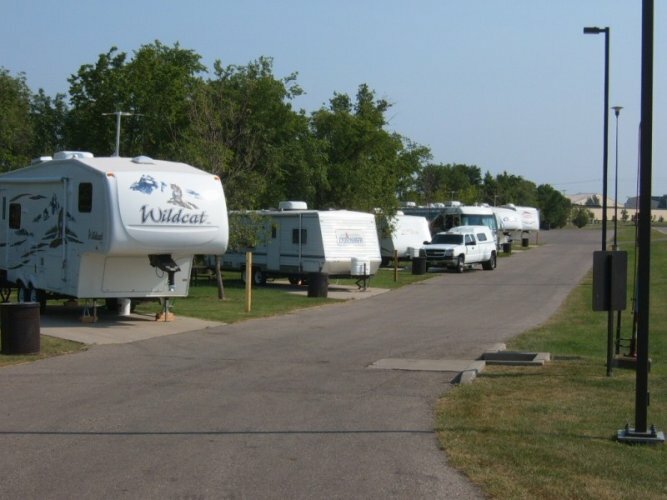 This small famcamp is only convenient if you are traveling on Highway 2. It is not big rig friendly. We have a 40' class a and our back wheels are off the concrete. Also no place to park your car near your rig. Jacks are off the concrete and since it had been raining ground very wet, so be sure and bring boards to put jacks on. Water only works in a few sites so you have to share water with a splitter if your neighbor will allow. $5 a day with golden age pass. Only 30 amp. Would not stay again. A very small 6 space, nicely paved park with a very attractive family picnic/game area with toilet facilities behind site. There is room for two or three additional trailers, if you choose to park on the grass or pavement next to site #1 or #6. although this is not advertised, I have seen other campers do this, and "borrow", with permission, 15 Amp power and use a "Y" for grabbing some water from the adjacent power/water stanchions. Indoor rec people are very nice, and there are no camp host nazi's...you are on your own. 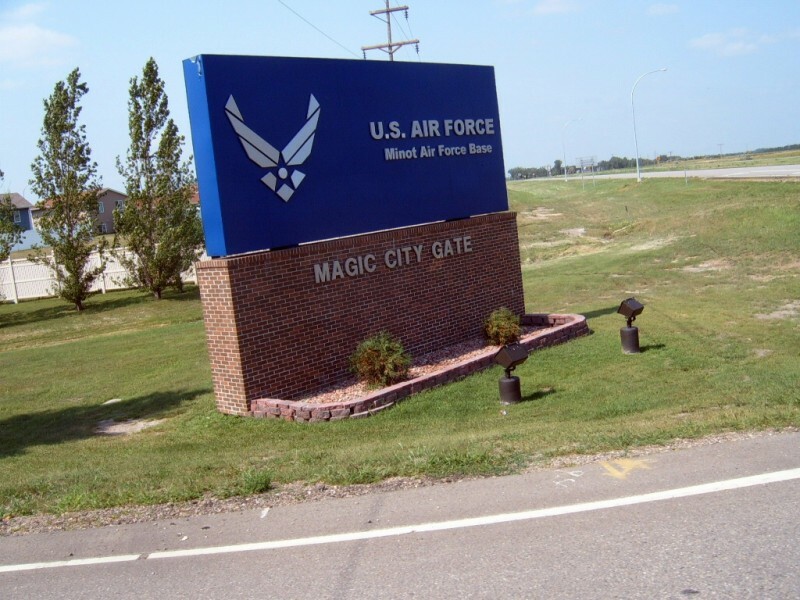 Quiet base, it has had its share of problems (Feb-June 08) with its B-52 nuclear surety inspections, and people are very businesslike, yet very cordial. No laundry at site, but facilities are on base. Good Commisary and BX. Would certainly return. W. K. left this review using the Directory software: Nice place to stay when there is no activity in picnic area behind parking slots, but can be quite noisy wheb there is a big picnic going on. Presently only four sites are available as two are occupied by squatters. The park (and the base, for that matter) are in an out of the way location and not conducive to overnights unless, like us, you happen to be traveling across North Dakota on US 2. The main gate is called the "Magic City" gate and there is nothing on the signs that indicate that "Magic City Gate" IS the main gate. It is the second gate you come to if you are traveling north on US 83 off US-2. 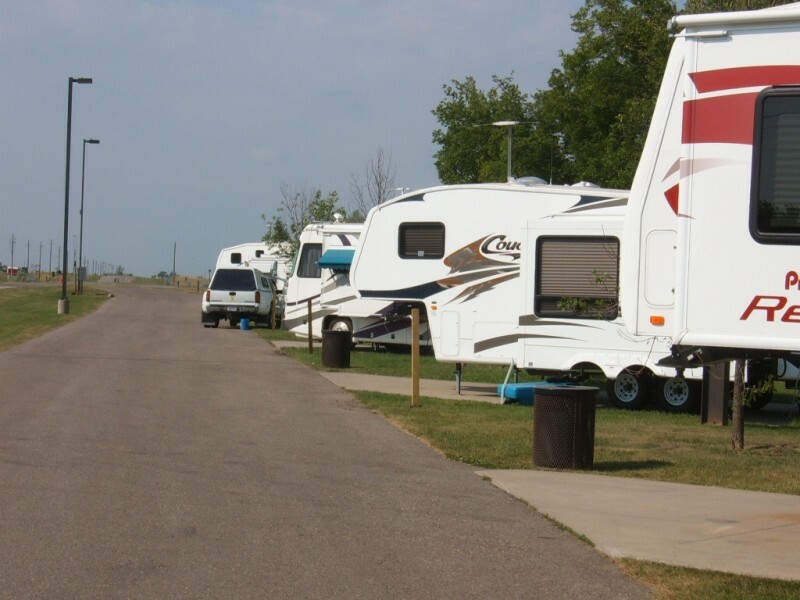 However, the traffic lanes are large enough to handle a large RV with no problems. We arrived early on a Saturday afternoon and discovered that four of the available sites had cars parked in them. There was an event taking place in the park and apparently some of the attendees had decided that the vacant spots made good parking places. There were no signs indicating that the spots were reserved for campers, which might have helped. There was one spot that didn't have a car parked in it and we backed into it with some difficulty. The "road" out front is very narrow and the light poles can present problems. Once we hooked up we discovered that the water pipe had an underground leak, so we ended up having to fill our tank and use our pump--not a major problem but we would not have chosen this site if we had been aware of this problem before hand. There is no place to register on a weekend. The sign on the Outdoor Recreation office informs you that you need to come back "during normal business hours." There is no way to do a night registration and since we were leaving early on Sunday morning we ended up sending a check to them for what we hope is the correct amount (based on the information we had.) Other than that it was a nice, quiet site (once the activity at the park had ended) and we spent a pleasant night there. It was just frustrating to have so much trouble backing into the one site that was available because cars (not RVs) were parked on the other spaces. The commissary was nice, but we never did find the exchange--unless it was the "mini-mall" that we saw. Everyone we did meet (including the gate guards) were very friendly. There are only 6 sites. Hard surface road with concrete paved sites. Very nice campsites. No sewer, dump station very close in area. PX, Gas Station and Commissary close and easy to find. You cannot make reservations; it's first come/first served. We had to wait 2 days for a site to open. There is a huge overflow parking area next to Commissary (formerly a mobile home park). We used lodging for two days until a sited opened. Awesome recreation park right behind camp sites. No nearby showers. A nice stop for a few nights. Easy off/on base. Nice clean campsites. No sewer but dump station right there for when you are ready for it. PX and commissary close and easy to find. Gas station easy to find and get into. Only problem was base laundramat. There is a sign in the front but the laundramat is on the back of the building and not signed well so had to hunt for it. Overall, very good. Awesome park right behind the pads!! Great place for 4th July Celeb! Very few spots though, no sewer, laundry is in some far away place in the back of some building next to the bowling alley; not convenient with small children. No nearby showers. A nice stop for a few nights. Very close to Commissary, easy off/on base. Good place to overnight. Had super 4th July show in park behind rig. Better if sewers were available.